Melt the butter in a large cast iron skillet over medium high heat. Add in the onions and garlic and cook until just tender and fragrant, about 3 minutes. Add in the bacon, and cook until the fat begins to render and the bacon begins to brown, about 5 minutes. Add in the remaining ingredients (except the salt). Bring to a boil, reduce heat to low and simmer, stirring frequently. Continue to simmer, stirring frequently, until the mixture is very dark and syrupy. 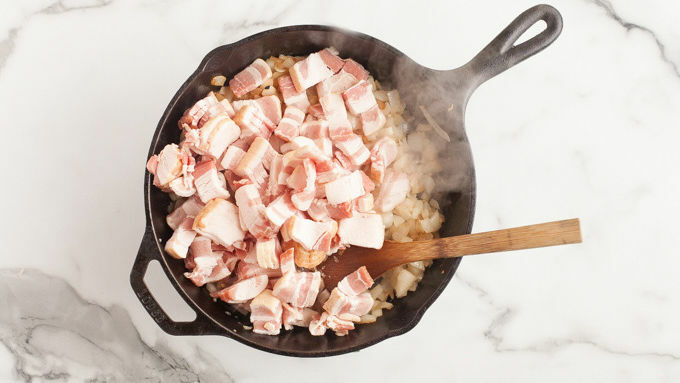 This can take anywhere from 15-45 minutes depending on the fat content of your bacon. Cool completely, then transfer to a food processor. Pulse until well chopped, but not pasty. Store in an airtight container in the fridge for up to 3 weeks. Yields 16 servings of 1 tablespoon each. Don’t have maple syrup? Molasses also works well in this recipe. 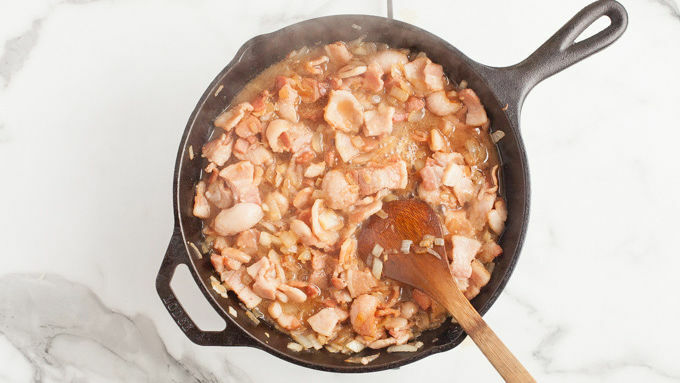 If your bacon is exceptionally fatty, you may way to drain off some of the bacon grease before you move on with the recipe. Some folks like to add fun mix-ins like coffee or herbs or spices to their bacon jam, but we’re keeping it simple. Feel free to experiment with what flavors make you happy. 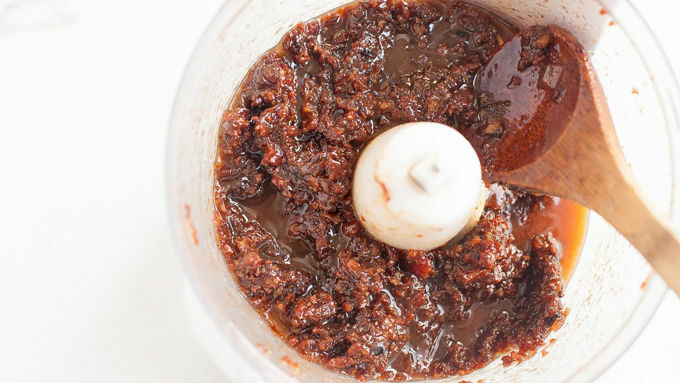 Bacon jam is a condiment that walks that glorious line between sweet and salty. It’s sweet enough to feel decadent and savory enough to feel rich. Like most things in life, the best way to eat bacon jam is the also the simplest—slathered on a perfectly fluffy piece of warm bread or on your favorite cracker. But bacon jam is also incredibly versatile. Add some bacon jam to your next grilled cheese sandwich. Toss a little bit into your scrambled eggs in the morning. Use it as a condiment on a burger (especially if you add blue cheese and caramelized onions, too). Stir it into softened cream cheese and make a really quick and really tasty party dip. Whisk it together with some olive oil and vinegar to make an awesome salad dressing. Make a BLT and sub in bacon jam for the “B”. If you can eat it, chances are, you can add bacon jam to it, and it’ll make it more delicious. 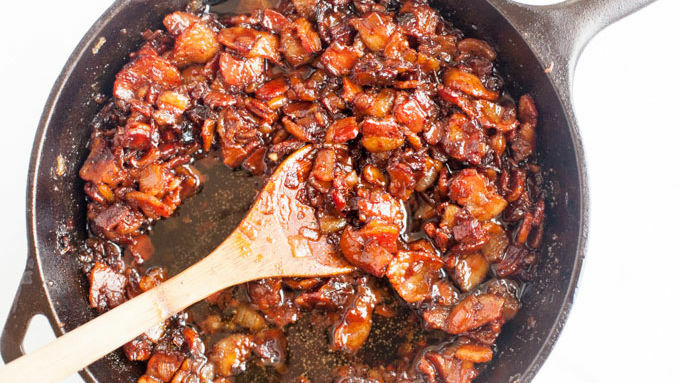 Bacon jam is pretty easy to make at home on your stovetop. We recommend using a large cast iron skillet in this recipe. The larger surface area means you get your bacon jam thick and syrupy faster, and the thick cast iron heats more evenly, making sure you don’t scorch your jam. The mixture will get darker and thicker the longer it cooks. Keep stirring—as it gets thicker, it’ll want to stick to the bottom of the pan. No worries. Just scrape up those delicious parts. When the jam looks very dark and thick, you’re finished. Depending on how fatty your bacon is, this may take 15-45 minutes. You can either stop right there and enjoy your chunky bacon jam as-is, or let the jam cool completely before transferring it to a food processor for a quick trip around to chop it up. You don’t want the jam to be smooth like a paste, so just pulse it until it’s a little less chunky. Then transfer the jam to a container with a tight-fitting lid and store in the fridge for up to three weeks—although chances of it lasting that long are slim. 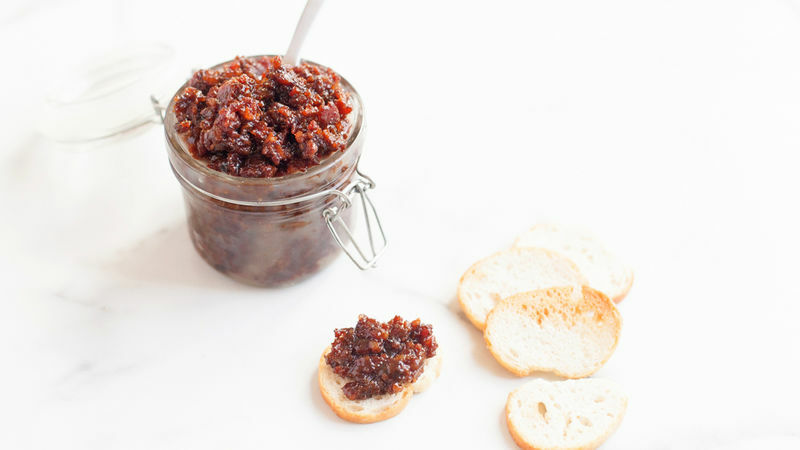 Bacon jam is a condiment that walks that glorious line between sweet and salty. It’s sweet enough to feel decadent and savory enough to feel rich. Like most things in life, the best way to eat bacon jam is the also the simplest—slathered on a perfectly fluffy piece of warm bread or on your favorite cracker. But bacon jam is also incredibly versatile. Add some bacon jam to your next grilled cheese sandwich. Toss a little bit into your scrambled eggs in the morning. 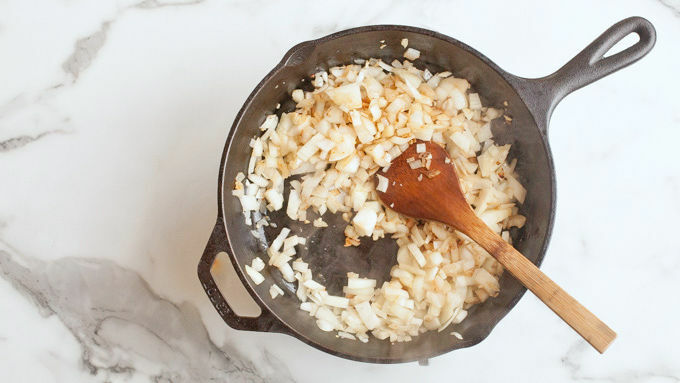 Use it as a condiment on a burger (especially if you add blue cheese and caramelized onions, too). Stir it into softened cream cheese and make a really quick and really tasty party dip. Whisk it together with some olive oil and vinegar to make an awesome salad dressing. Make a BLT and sub in bacon jam for the “B”. This is one case where the possibilities really are limitless. If you can eat it, chances are, you can add bacon jam to it, and it’ll make it more delicious. Bacon jam is pretty easy to make at home on your stovetop. To cut down on time, we recommend using a large cast iron skillet in this recipe. The larger surface area means you get your bacon jam thick and syrupy faster, and the thick cast iron heats more evenly, making sure you don’t scorch your jam. The mixture will get darker and thicker the longer it cooks. Keep stirring—as it gets thicker, it’ll want to stick to the bottom of the pan. No worries. Just scrape up those delicious parts. When the jam looks very dark and thick, you’re finished. Depending on how fatty your bacon is, this may take 15-45 minutes. You can either stop right there and enjoy your chunky bacon jam as-is, or let the jam cool completely before transferring it to a food processor for a quick trip around to chop it up. You don’t want the jam to be smooth like a paste, so just pulse it until it’s a little less chunky. Then transfer the jam to a container with a tight-fitting lid and store in the fridge for up to three weeks—although chances of it lasting that long are slim.